A new school year is just around the corner. Outfitting college bound students is faster and much more convenient when some of the shopping is done on-line. 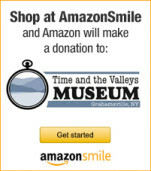 Time & the Valleys Museum is a registered non-profit with the Amazon Smile program. If you’re an Amazon shopper, Amazon will donate 0.5% of the price of qualifying purchases to Time & the Valleys Museum. There is no additional charge to YOU the Amazon customer. This is a GREAT way to outfit your college student, save lots of time and help Time & the Valleys Museum. Use this link (https://smile.amazon.com/gp/aw/ch/about) to find out more and get started today!